Today we’re celebrating Dr. Seuss’ birthday, the National Read Across America Day, sponsored by the National Education Association. Our daughter Heather, a preschool teacher, is having a party at the school with her class. 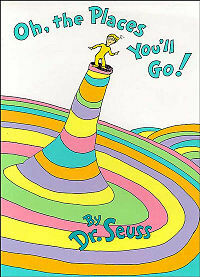 What fun things can you do today to celebrate Dr. Seuss’ birthday – yes, even if you are an adult! Dr. Seuss’ books were written for children, but they are filled with profound wisdom like the poem above, and are just plain FUN! He’s one of my new favorite authors lately, and I want to buy a collection of his wonderful books to be encouraged and to encourage our kids and grandkids! Here are some great quotes by Dr. Seuss. Here are some activities for younger kids for 15 Dr. Seuss Books, including The Foot Book, Dr. Seuss’ ABC, The Lorax, and more. This is the Dr. Seuss website. Have a read-a-thon of books for the day with your teen and friends, and award prizes they’d love. Sometimes as adults we can become stressed out or just way too serious. Take advantage of a fun day like today to relax and just have FUN! Remember today is your day, your mountain is waiting – oh, the places you will go! ← Kemper Contemporary Art Museum – Exuberance! My kids loved Dr. Seuss!